There is a lovely effect called "Water Monte" in which an audience follows a series of cups around to guess where the one full of liquid is. This is a fantastic version of "Water Monte," absolutely perfect for any comedy presentation. "Liquidate" has everything you need to amaze your audience, with many subtleties, and an unexpected finale. It's very easy to do, and suitable for any kind of performance venue or audience. The magician shows five disposable cups. The first one has some water in it. The performer pours its content completely into another cup. The magician places the tumbler now filled with water to the side in full view, on the table. The performer then mixes the order of all the cups, and the spectator is to guess which is the tumbler containing the water. The spectator guesses correctly. After that, the magician explains he will make a bet, and taking out his wallet, he shows some bills. He places the wallet on the table, near the cups and in full view. Then he mixes the cups again, but this time the spectator does NOT find the one containing the water. The magician shows that the four tumblers are empty! Taking the tumbler that originally had the water in it, he shows that the water has returned! He pours the water into one of the cups. The cups are mixed around. Once again, the spectator does NOT find the one with the water. The magician shows that the water has vanished, showing that all five tumblers are empty!!! For the grand finale, the performer takes his wallet that has been sitting on the table, and pours the vanished water from it!!! Secret gimmick not included, but can be purchased from a magic dealer. "A beautiful and visual magic effect for any kind of audience. Minimum requirements we always find in the magic of Quique Marduk." "I love tricks out of the ordinary. Liquidate is one of them, and I like it very much!" 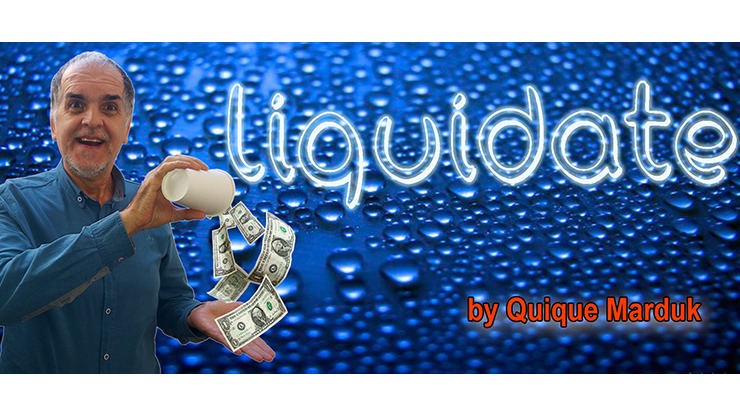 "Liquidate is really a wonderful routine, full of surprises, with an ideal climax... I just love it..."
doug asks: so i have to order twice? once for the trick and once for the gimmick? what do you get when you order the trick if the gimmick is not included?